East Columbus Facial Cosmetic & Skin Center is offering a microdermabrasion facial with a chemical peel. A $150 value for only $75! East Columbus Facial Cosmetic & Skin Center is the newest addition to East Columbus Oral Surgery Specialists. Dr. Andrew Mullendore and Dr. Douglas Von Kaenel understand the importance oral health and the interacting with patients on a more personal level to instill a sense of trust, confidence and well-being. With that being said East Columbus Facial Cosmetic & Skin Center was added. Dr. Mullendore and Dr. Von Kaenel are your oral surgery specialists and now have a team of skin specialist available. PUT YOUR BEAUTY IN THE HANDS OF PROFESSIONALS AND CONTACT EAST COLUMBUS FACIAL COSMETIC AND SKIN CENTER. 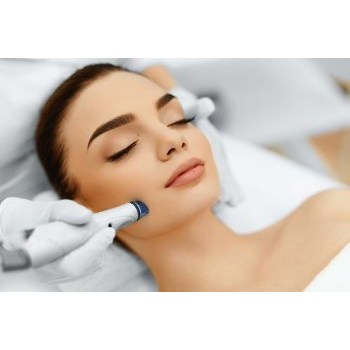 Microdermabrasion $85- A diamond wand brushes away surface skin cells to brighten skin complexion and reduce the appearance of fine lines, wrinkles and acne scarring. Also helps enlarged pores, age spots, uneven skin tone or texture, and dull complexion. Microdermabrasion with Chemical Peel $150- The chemical peel adds another layer of depth but it's still a superficial peel. Chemical Peel with Facial $75- Chemical peels help correct sun damage, uneven pigmentation, and reduce fine lines and wrinkles. This is a superficial peel. Dermaplane Only $50- Gentle Resurfacing technique that uses a blade to gently remove dead skin cells and all the fine hairs on your face. Helps treat acne scars and wrinkles. Dermaplane with Facial $70- Gentle resurfacing technique that uses a blade to gently remove dead skin cells and all the fine hairs on your face. Includes a full relaxing facial. Dermaplane with Chemical Peel $125- The chemical peel adds another layer of depth but is still superficial. Ultra-Hydration – Targets dry, dehydrated skin to restore hydration, and to provide soothing, cooling and calming comfort. Skin Brightening- Targets pigment related issues to help address dark patches and uneven skin tone. Acne and Oil Control- Helps to clear skin and prevent breakouts. ZO (ZEIN OBAGI MD ) Skin Health Products- These products are medical grade products and are used for all facial services. Available for purchase in-office or on our website. 10% off in-office with a procedure done same day. Botox/Xeomin $12 unit- Helps smooth and reduce wrinkles by relaxing muscles of facial expression. You will maintain function, but it is reduced thus wrinkles diminish and you are left with softer more youthful appearing skin. This lasts around 3-4 months. Dermal Fillers $500 for each 1cc syringe-Fills lines and wrinkles that are not treatable by Botox and you can get the nice plump lips you have always wanted. Lasts up to a year.